The bungy jump or (bungee jump as some choose to spell) is the ultimate thrill created as an adrenaline-fuelled attraction by the legendary AJ Hackett in the 1980s. It’s since become famous all over the world but there’s nothing better than experiencing it where it all began, right here in NZ! To help you achieve this lofty ambition, we thought we’d put together a list of our favourite 7 places for bungy jumping in New Zealand! The iconic Auckland Harbour Bridge is usually admired from ferries, yachts, surrounding areas and on postcards. Who would’ve thought it would be a great place for a bungy jump as well. AJ Hackett Bungy is who, which is exactly why you have the opportunity to take the plunge yourself. From a height of 40 metres, you’ll be able to leap from the underside of the bridge to the waters of the Waitemata Harbour below. You can even choose to add water touching to the jump giving you an extra sensation to enjoy. If you’re heading to the North Island tourist hotspot that is Rotorua then you’ll be able to add bungy jumping to all the other activities they have to offer (which is quite a long list)! The good people at Velocity Valley have their own adventure park which boasts a 43 metre high bungy. The fun thing about this one is you can do it solo, as is the traditional way, or you can buddy-up with a friend in a tandem jump. If you’re not sure you have the courage to go it alone, then sharing your nerves might make it a little easier. 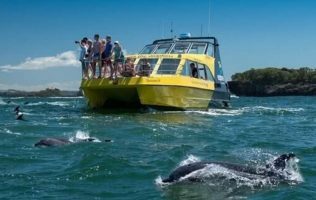 “Find your scream” is the motto for this experience and it’s definitely an appropriate one if you’re after a thrill in Taupo. From a secluded clifftop, you’ll walk out across a platform that hangs high over the mighty Waikato River. From there it’s a 47 metre free fall to the waters below, which is actually the longest water touch bungy in the country. This one will definitely test your lungs out and they also offer an Extreme Bungy Swing experience as well which you can do as a combo. The idyllic Hanmer Springs is famed for its soothing waters which have drawn people from far and wide for many years. In more recent times it’s also become known for adventure tourism like its jet boat and bungy jumping operation. The Hanmer Springs Bungy comes with a huge amount of charm being setup on the 135 year old Ferry Bridge. The 35 metre jump towards the beautiful Waiau River below is almost, in one sense, a peaceful experience that will fill you with warmth and serenity… Yeah right! We arrive at the one that started it all. The world’s first commercial bungy jump that was created, where else but Queenstown. The historic Kawarau Bridge Bungy. This is the place where we got a taste of AJ Hackett’s vision and it’s where you can also take a bit of history with you. Against the beautiful backdrop of the Kawarau Gorge with the river that runs through it, you can see why he chose this as his first location. This 43 metre jump has been done by thousands and is the purest of them all. Being able to tell your friends that you went to the original bungy is pretty cool as well. The second of the three bungy jumps you can do in Queenstown is the Ledge Bungy. The Ledge is the go-to choice for all the self-confessed freestylers out there. In fact, it was actually designed with them in mind with its diving platform-like setup and 47 metre drop. The experience includes a short gondola ride to the top which gives you a little bit of time to think about your approach. With room for a run-up, a jumper’s expression can really take centre stage with this one. This is the bungy that really allows you to put your own personal touch on the experience. A great one to consider. We finish with the biggest one of them all and it’s the biggest by a long way. The Nevis Bungy offers a staggering 134 metre free fall and a crazy 8 second drop. Located in a more isolated part of Queenstown you’ll be taken by their equally epic 4WD bus which will no doubt give you time to think about what you’re going to embark on. Upon arriving, the sight of the bungy itself will no doubt give you pause for thought. But go through with it you will because you’re made of tough stuff and the thought of conquering the great Nevis Bungy will be too great an accomplishment to turn your back on. Nothing beats bungy jumping in New Zealand! As you’ve seen, there are some great options for bungy jumping in New Zealand that simply can’t be beaten. No matter where your adventures take you, you’ll be able to turn up the dials of adrenaline by taking the leap. A nice little bonus too is that if you’re a GO Rentals customer you’ll be able to enjoy discounts at many of these using your GO Play card! Superb stuff! "Two awesome activities, one spectacularly scenic site. NZ's highest water touch bungy and cliff-face extreme swing are waiting for you! Select ENQUIRE NOW or call the number below, quote GO Play to confirm your booking. Present GO Play Card on arrival."